Before the arrival of Miami Vice and MTV Spring Break, South Beach was home to the largest cluster of Jewish retirees in the country. Drawn by the small apartments, low cost of living, sunny weather, and thriving cultural life, they came by the thousands seeking refuge from the Northeast's brutal winters. By the 1970s, these former New Yorkers had turned from seasonal visitors to year-round residents, making Miami Beach home to a population that was primarily over 70 and overwhelmingly Jewish. 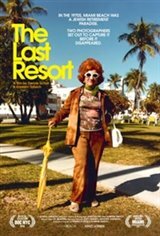 The Last Resort takes audiences on a journey to the iconic Miami Beach of that era through the lens of young photographers Andy Sweet and Gary Monroe. With cameras in hand, they embarked on an ambitious 10-year project to document this unique chapter in the city's history, which would soon be erased by the turbulent 1980s. Featuring interviews with Pulitzer Prize winner Edna Buchanan, filmmaker Kelly Reichardt, photographer Gary Monroe, and more, The Last Resort is a stunning testament to a community all but forgotten - until now.